Pamplin Media Group - Host or Hoax? Meet Nadia . . . Host or Hoax? Meet Nadia . . .
She's listing dozens of short-term rentals in Portland via Airbnb, though the city requires hosts to live on-site most of the year. Nadia claims on Airbnb to live in Portland. And in Seattle. And in San Diego. Nadia's face and name come up a lot for travelers perusing nightly rentals on the Airbnb website. 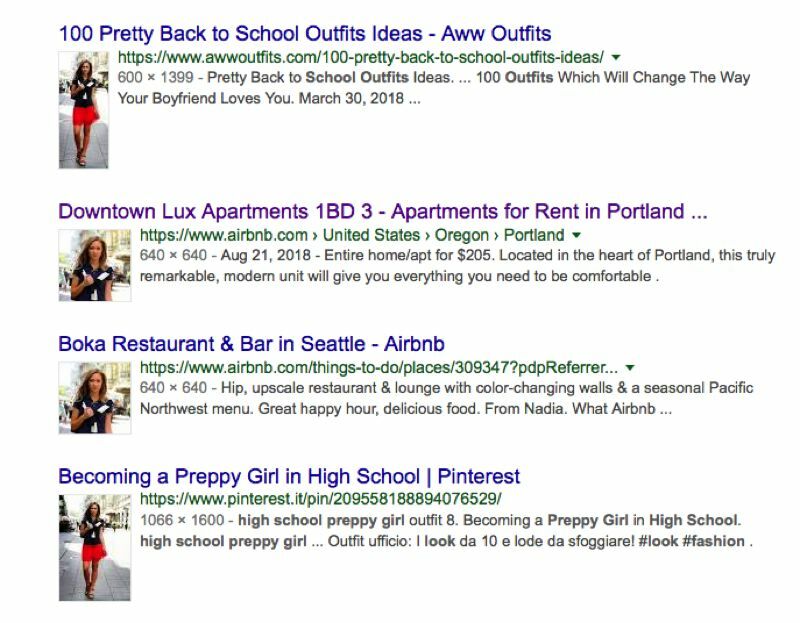 "Nadia's home is located in Portland, Oregon," she states on the site, where she recently had at least 50 different short-term rentals listed in the city. One wonders how Nadia fulfills a city requirement that short-term rental hosts live on-site at least nine months a year, especially as Airbnb is crowing that its One Host, One Home initiative booted Portland hosts off its site who were illegally renting multiple properties. But Nadia can be in a lot of places at once. Elsewhere on Airbnb's website, Nadia says that she lives in Seattle, and in San Diego. When some travelers posted reviews of her properties, she invited them to rent some of her 575 other Airbnb sites when they visit Portland, Seattle, San Diego, Los Angeles, Chicago or New York. More than 4,200 travelers have posted such reviews, giving her an average Airbnb host rating of four-and-a-half stars out of five. Nadia says she speaks English, French and Spanish, and includes an official Airbnb seal of approval noting her ID was verified. That's curious, because Nadia appears to be a fake. Nadia's photo posted with her Airbnb listings makes her look like a model, perhaps because she is. The same photo — with her wearing the same outfit — can be found on an unrelated entry on the Pinterest website titled "Becoming a Pretty Girl in High School," and on the Aww Outfits website in a piece titled "100 Pretty Back to School Outfits Ideas," among others. A Portland Airbnb host discovered Nadia's big footprint on Airbnb when he tried to list a second Airbnb property for a family member, to help pay for steep medical bills. The next day, he said, Airbnb called and said he couldn't do that, because of the One Host, One Home initiative, which the company claims is weeding out commercial, hotel-style uses of the short-term rental platform in Portland. The host, fearing retribution from Airbnb if he gave his name, wondered how Nadia could get away with listing several hundred properties. But what he didn't know about is a loophole in the city's short-term rental ordinance. Until recently, neither did city Commissioner Chloe Eudaly, who regulated Airbnb when she oversaw the Portland Bureau of Development Services for 20 months. It turns out that the city's short-term rental ordinance doesn't apply to landlords in commercial-zoned areas, if they file for a relatively routine change in occupancy to allow hotel-style uses in their buildings. In the past couple years, owners of unfilled downtown apartments and condos are increasingly renting out their vacant units on a nightly basis via Airbnb. That Airbnb host who analyzed Nadia's listings also tracked the rents she was fetching, and estimated she was grossing $5,000 to $7,000 a month for each of her Portland units from June through September. Airbnb declined to be interviewed or to respond to questions about Nadia's listings. Instead, it issued a two-sentence statement: "Airbnb is the only short-term rental platform to implement a One Host, One Home policy and as a result, 92 percent of hosts in Portland are sharing just one listing," wrote Airbnb spokeswoman Molly Weedn. "The remainder are sharing listings which are exempt (from) the policy because they are boutique hotels, hosts sharing listings that are rented on a long-term basis or people who are helping a friend or family member share their space as a co-host." entirely from tourists and other short-term visitors. Mike Liefeld, a supervising planner for enforcement at the Bureau of Development Services, said some downtown-area condo and apartment complex owners have obtained the necessary building permits to change their terms of occupancy. That frees them from having to meet requirements of the city's short-term rental ordinance, by legally converting an entire apartment or condo building into a hotel. They can do that for select floors in a building, or even for a single unit, Liefeld said. The main requirement is installing proper lighting and exit standards required for hotels, but modern apartment and condos often meet those anyway, he said. So it's possible Nadia isn't violating the city ordinance, if landlords at the buildings she's marketing have obtained the necessary permits. Not all landlords are doing so. The owner of the Ladd Tower, for one, didn't get the proper permit until neighbors complained and the media reported it. It's hard to tell if Nadia's Portland listings are legally hotels, because she doesn't use the proper building names to advertise them. They are simply listed as units in the Pearl District Condos, Market Street Condos, Downtown Lux Apartments, and Modern Luxury Apartments. It's impossible to find out the addresses — even for city regulators — until someone plunks down money to rent one of the units. Nadia's story takes on greater significance in the context of the city's long-running negotiations with Airbnb, in which the city is offering to abandon mandatory inspections of hosts' properties. Instead, hosts would get city permits merely by signing up on Airbnb's website and attesting that they meet the city's safety requirements. In exchange, Airbnb would divulge hosts' names and addresses to city regulators. If Airbnb has truly vetted Nadia's ID, as stated on its website, that raises a question of whether the city can trust Airbnb to register its own hosts. Commissioner Eudaly is skeptical about the looming deal with Airbnb. "I have not felt that Airbnb is bargaining with us in good faith," Eudaly said at the Sept. 12 City Council meeting, when she first learned of the loophole in the city's short-term rental ordinance. "They have refused every suggestion that we have put forth to exclude hosts that are not following our rules." Airbnb may have eliminated some of the illegal commercial listings, she said in a recent interview, but now they appear to be adding more commercial sites that aren't even covered by the city ordinance. Eudaly refers to apartments and condos being converted to Airbnb rentals as "unattended hotels." Nadia's name and claim to live in three cities aren't the only seemingly bogus claims on her Airbnb listings. She also posted the wrong photos to identify many of her properties. A quick scan through hundreds of units she had listed on Sept. 19 showed the same photos being used repeatedly to depict different buildings. 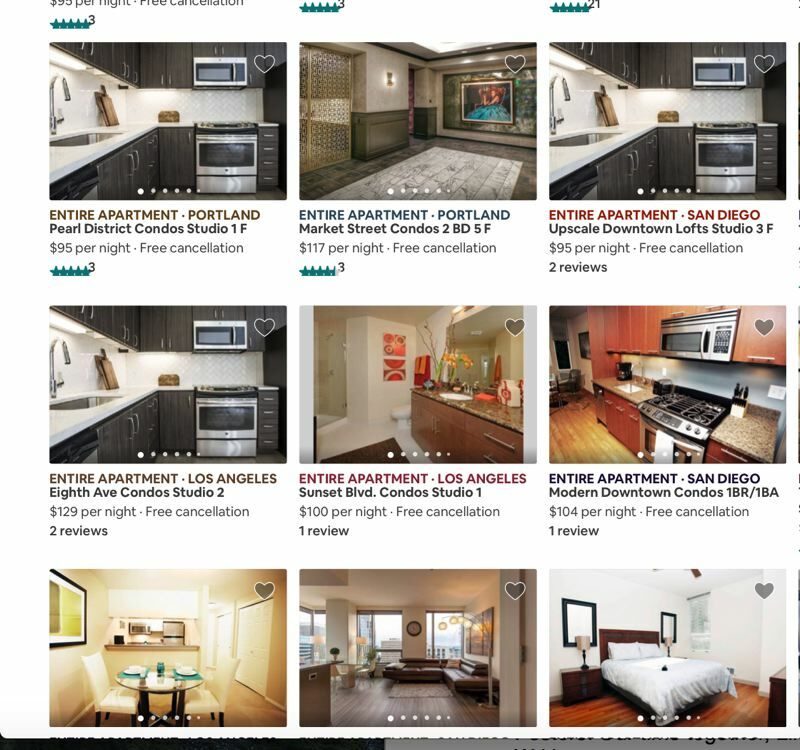 One kitchen photo was used to advertise five different units, including one in the Pearl District Condos, one in Los Angeles, and another in San Diego. Several of Nadia's customer reviews posted in August cited inaccuracies in her listings. The reviews raised questions about whether there really is a person named Nadia or one single individual claiming to be her. "First, it's not Nadia but a guy named Mo," wrote one reviewer after staying at a Nadia property in Boston. But another wrote of their stay at a Portland property: "Nadia was great and made sure that we were okay throughout the whole time." One reviewer criticized the amenities of the Boston unit and called Nadia a "poor host, completely unresponsive. ... There were a few problems with basic amenities, e.g. The kitchen lights did not work, but we were unable to get hold of Nadia to get these sorted out." Most of her reviews in August were positive, such as this one: "Nadia is such a great host as well, super quick response." Another wrote, after staying in Portland's Market Street Condos: "Unresponsive hosts: I contacted Eugene about a broken window in the apartment . ... I did not hear back from him. I also contacted Nadia the day I left about leaving my gold framed glasses in the apartment— no response." Liefeld, the city's chief enforcer of the short-term rental ordinance, said the city's stiffer fines imposed since February 2017 have borne fruit. The bureau has issued 186 citations to hosts violating the short-term rental ordinance, and assessed some $440,000 in total fines, Liefeld said. Many of the cited hosts now are complying with the rules, he said, but by no means all of them. Some merely ignored the fines, which are accumulating as liens against their properties, he told the City Council on Sept. 12. Some who were operating multiple properties merely switched the listed hosts to other names, he said in a follow-up interview. "It's just a name change," he said. "They're trying to make it appear that there's not more than one property per host." Liefeld said it's extremely difficult for the city to enforce the requirement that short-term rental hosts live on-site at least nine months of the year. City inspectors can't keep an eye on who is entering and exiting several thousand short-term rental units each day and night. Liefeld supports the negotiations with Airbnb, because having the names and addresses of hosts will make city regulation easier. "What we're forgoing is essentially a safety inspection," Liefeld said. But his bureau can still do random spot checks for safety violations, he said, and continue to investigate sites where there are complaints. There's another growing controversy over apartment and condo owners using Airbnb to rent out their vacant units. Mary Sipe, who lives in an affordable unit in the Pearl District, complains that the Block 17 apartment building across the street at 1161 N.W. Overton St. has caused a hubbub of activity. "Everyone in the neighborhood knows they're using it for Airbnb," she told the City Council. "They have people coming night and day with suitcases." That could be a security issue for apartment tenants in a locked building, Sipe says. But Sipe and Eudaly are more concerned about the impact on the rental housing market. A recent wave of development resulted in a glut of higher-end apartments downtown and in the Pearl District. Some landlords are offering two or three months' free rent to sign up new tenants. But other landlords are turning to Airbnb to fill their empty units. And some fear that's taking hundreds of units off the long-term rental market, reducing the housing supply. "It's keeping the rents high," Sipe said. Ordinarily, "if your vacancy rates are high, you start lowering your rents." But if landlords turn instead to Airbnb, "that's not going to apply." Debi Hertert, leader of the Portland-based Host2Host trade group of Airbnb hosts, said Airbnb now is expanding its listings by seeking out boutique hotels and apartment complexes. In Miami and elsewhere, Hertert said, Airbnb is partnering with an apartment developer to build an entire building that will be rented out as short-term rentals. "We have to figure out what really is Airbnb in our city," says Felisa Hagins, the political director for SEIU Local 49, a union that has lobbied in Salem for renter protections. Landlord interests at the Capitol have fended off such bills, Hagins said, by arguing that a larger housing supply will let market forces take over and ease rental rates. "They say the way we deal with the housing crisis in Portland is we build our way out of it," Hagins says. "I don't think it's as simple as that."